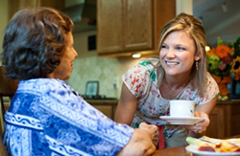 Always Best Care can assist seniors who wish to remain in their home, but require some assistance. We provide the right level of care for your situation. Our In-Home Care services include assistance with the following: Bathing, dressing, transportation, grocery shopping, light housekeeping, meal preparation, medication reminders, skin integrity, incontinence care, stroke, terminal illness, Alzheimer's care. Our care providers meet the following requirements prior to being employed: criminal background checks, three references, CPR and First Aid certification, health screening and extensive training. A thorough orientation is conducted and a skills assessment test must be completed. We begin each start of care with a free assessment to discuss your needs and assist with a personalized care plan specific to you. Our flexible care programs range from hourly to live-in. Services can be covered under most long term care insurance policies and veteran's pension benefits. We accept private pay, long term care insurance, and Medicaid. We also have a placement program to assist you with the right Assisted Living Community. We will meet with you personally to discuss and determine your needs, work within your budget, and pre-qualify each community to ensure they will provide the best level of care for your needs. Always Best Care offers this service free to seniors in our community. Always Best Care is licensed through the Department Of Health and Hospitals in the State of Louisiana. We assume bonding, liability insurance, and workers compensation. Our staff consists of a registered nurse, certified social worker, and care coordinator. The owner, Shonda Boudet, is a certified Geriatric Care Manager. Always Best Care is an American Red Cross Caregiver affiliate, a certified trainer with American Red Cross Family Caregiving Program, a member of the National Private Duty Association, a member of the Woman's Council in Greater Baton Rouge, and a corporate sponsor for the Alzheimer's Association for the Capital Area.